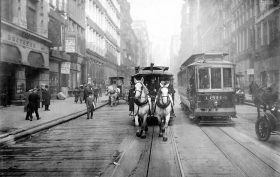 On this day in 1832, the John Mason, a horse-drawn streetcar, began its route between Prince and 14th Streets. Named for the railroad magnate who commissioned it, the new transportation addition was the first of its kind and a vast improvement over the horse-drawn omnibus that was currently in use. Built in 1827, the omnibus was little more than a boxy stagecoach, with riders packed into it like “sardines in a box with perspiration for oil. Passengers hang from the straps like smoked hams in a corner grocery.” Fares were only 15 cents, and though cars were only supposed to hold 15 people, riders even clambered onto the roof, holding on for dear life.